Then one of my only favorite girl groups hit the stage, After School with their new single “Shampoo” (Dont’ ask me about the name). Korean female celebrities are known for wearing short shorts, but those things look so much more obscene in person, especially paired up with their oiled legs, but hey whatever makes good TV. Then the girl duo, Sistar, went up after them, and their song “Ma Boy” was very interesting. Actually the only girl group of the day who annoyed me was A Pink, the cutesy act just doesn’t cut it for me: winking into the camera, flicking hair, and blinking “I don’t know” eyes into the camera sets us back about 150 years. 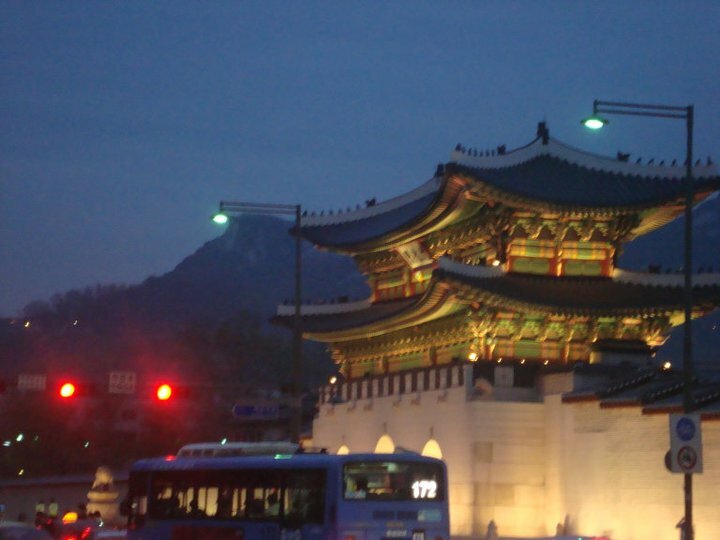 The focal point of foriegner activity in South Korea is Itaewon, hands down. On the subway, I start to realize there are a few more non-asian faces than usual (which usually means just about 5, but that’s a significant number here!). It means we have arrived! 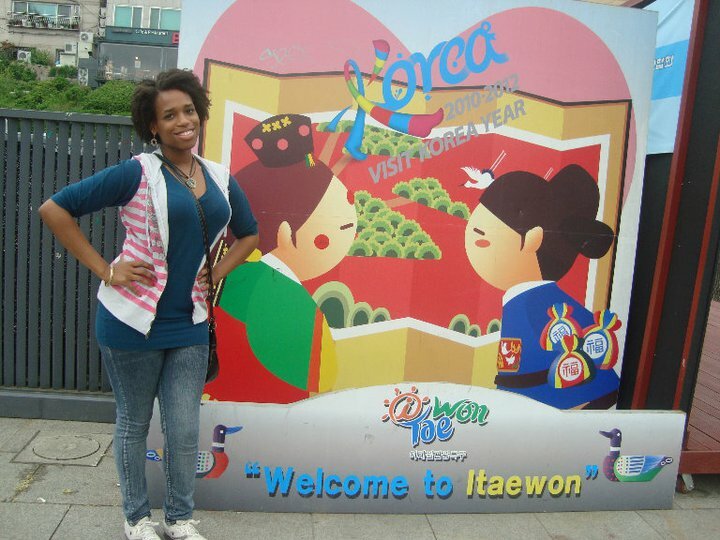 Diana and I have visited Itaewon before, just to shop around and see what all of the hype is about, all of the store vendors speak english and there are familiar food places: Outback Steakhouse, Quiznos, and even Taco Bell. It’s a fun place to go and socialize when you don’t speak Korean, this is the place to find most of the natives who want to interact with foriegners and practice some English. At night time though, we discovered it gets a little crazy. Diana and I had a pretty boring day yesterday, didn’t feel like looking at museums or hiking around, so we only ate and read a book at our hostel. Since it was already Thursday, we decided to head out at 8pm to bar hop in Itaewon (Our hostel is in a bar hotspot, Hongdae, but we don’t speak Korean so we felt Itaewon would be more fun). After finishing my book though I took an unprecedented nap and woke up at 9:30! I thought this meant we wouldn’t make the long trip (35 minutes) to Itaewon anymore, but Diana wanted to perservere. We were so lazy though that we didn’t even change into cuter, bar-hopping outfits, just went as was (which proved to be good enough). When we arrived, it was a little awkward deciding which bar to enter, and we realized on the subway that Diana forget to grab her passport to prove she wasn’t a minor. Hoping to brave our way through that obstacle, we approached a nice bar called Helios. The music was nice and on the way up a white guy already started hitting on poor Diana, his opening line was the magic words, “Let me buy you a drink”. This was looking promising, even though he was a bit player-ish (talking about his condo in Orlando, lol) but the door man wouldn’t let Diana in without id. On the way out we ran into a pack of hot guys going in, and one of them pointed at me and said “Tampa?” (I was wearing my University of South Florida sweatshirt) It turns out he’s a University of Central Florida student, what are the odds? Too bad we couldn’t go in the bar with them, but they pointed out some along the way that don’t check id, so again we were off! Ok folks, I’m sure if you are interested in this blog you are probably also interested in K-Dramas. Korean dramas are part of the Hallyu wave that bring recognition to South Korea world-wide. Many foriegners have seen the dramatic scenerio: Boy meets girl, hate each other (or have an embarrassing first impression), keep getting put together by fate, and end up in perfect love. After going through many series, you may notice the “bedroom scenes” are almost always kept to a minimum, kissing reserved for the ending, sometimes kisses throughout the series are just quick and close-mouthed. That may lead one to assume this country is ultra-conservative and barely touch before marriage….WRONG. Couples are EVERYWHERE here, and it is impossible to mistake them just as friends, if you get what I mean. As an American traveller in Asia, I know of the stereotype of promiscutity and overall “openess, but I’ve never seen so much PDA in my life, therefore, some stereotypes just are wrong. Couples have hands down each others back pockets, shoulder leaning, kissing, cuddling, the whole sha-bang. Though I must say, Koreans do a good job of living up to the Korean drama stereotypes, the men seem to put their women up on pedestals. My sister and I watched from a window as a guy ripped the burdensome purse off of his girlfriend’s shoulder, and wore it himself. Seeing men wear or carry purses is very common, almost expected. Korean men go out of their way to hold everything for their girlfriend and provide for her, it’s kind of sweet. Also, to display their togetherness, many couples also walk around in “couple Ts”, shirts that match, sometimes even entire outfits that match. I wonder if their behavior is shaped by the current popular TV dramas, was Korea more conservative 10 or 15 years ago? All I know, is I now understand why single women become so desperate and go on numerous blind dates. Being single here is like having a large, embarrassing sign pasted upon one’s back, not fun at all. I will upload photos to back up these statements later, I’m on a community computer and can’t save unfortunately. So my little sister Diana and I landed in Seoul just a few days ago. We landed at 3:15 pm, but it took us a whole 2 more hours to get OUT of the airport, we were running through customs, getting directions to our reserved hostel, and find the cell phone booth we reserved from as well. It was a bit shocking to look around and realize the only language I can entirely rely on is body language….wish I took the chance to brush up my Korean before! Being thrifty (cheap) young Americans, we navigated our way onto an airport bus, it only cost 9,000 won, so much cheaper than taking a taxi for the hour ride…..Of course we missed our stop though. Sidenote, did you know Korea is over 70 percent mountains? A hard fact to learn while luggin two suitcases around for an hour trying to find our hostel. Which leads to another discovery, Korea does not have street names, we have to locate ourselves in comparison to chicken restaurants, Family Marts, and various stores, lol. Diana was dying after the first lost half hour, from both embarrassment and pain I’m sure. I then stopped us at a cafe and asked the workers in broken Korean if they knew english, when that yielded no responses, I switched to Chinese….again nothing, so we went back to handy-dandy body language. The manager was really nice and actually walked us halfway to our destination. The hostel, Mr. Kim’s Guesthouse is something I will save for another post, this one I think I will reserve for our first day touring around.